Everything about 'A Royal Affair' is stunning. Its ambitious scope in terms of subject matter, its intelligence, its brilliant cast of actors (I'll now happily watch anything with Alicia Vikander in it), and its lavish production values. I cried at the end, with the once vital Caroline separated from her children and living in exile, and I laughed far more and far harder than I have at the last dozen or so comedies. The story of a doctor who gives a king new confidence and inspires him to greater things, it could easily be billed as Denmark's answer to 'The King's Speech'. It's far better than that. Yet I'm not certain the trailer (above) or theatrical poster (below) would have sold it to me. There's nothing wrong with either from an editing or design point of view, in fact both are stylish and sophisticated. But therein lies part of the problem: they aim to attract the traditional "heritage" cinema or "costume drama" audience. "Utterly seductive... an epic story of forbidden love" runs a quote from Radio Times, whilst the central image plays up the idea that this is the tale of a love triangle in fancy dress. Yes, I see the angry mob in the background, with an ominous fiery orange glow enveloping the stars, but the overwhelming impression this poster gives is that this is the tale of how two men court the same woman. Were that the case I don't think I would have been so moved by it, nor as thoroughly entertained. What's truly great about 'A Royal Affair' - aside from the stunning performances - is that it doesn't feel at all stuffy and period bound. In fact it feels modern and dynamic. And whilst period films tend to be conservative and usually play up a romanticised view of the past, this one is all about radical political philosophy: the ideals of the enlightenment versus the grip of the ruling class in eighteenth century Europe. This is the story of how a German radical basically exploited his friendship with the insane king of Denmark in order to institute a raft of audacious reforms which quickly (and, as fate would have it, temporarily) transformed one of Europe's most politically backward countries into its most progressive. And all before the French Revolution. If you can't find a way to make that sound exciting to an audience, let alone in the fractured Europe of 2012, you have no business selling movies. Is the titular "royal affair" important? Well, yes of course; But it isn't what the film is about. In fact even the central love story - not really a "triangle", because the king doesn't really give a damn - is mainly explored in terms of how it compromises the idealism and integrity of Johan Struensee (Mads Mikkelsen). For instance, after the affair becomes a convenient stick for the German's political opponents to beat him with using the newly free press, Struensee is driven to enact new censorship laws in an effort to safeguard his own interests. It's about how power corrupts and how absolute power corrupts absolutely. It's about the canny knack of the media and the aristocracy to mobilise the poor against their own interests - a theme that resonates very strongly today. And it's being mis-sold willfully, because the people who made the poster know and understand all of this. 'A Royal Affair' is a young film being sold as an old one for an easy buck. The market for historical costume epics is tried and trusted, whereas the appeal of eighteenth-century-radicalism-morality-fables is far less certain. I understand completely where Metrodome are coming from and I hope this release proves incredibly lucrative for them, because this film deserves to find an audience (even if it's the wrong one). 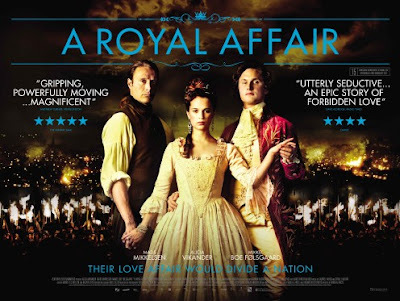 I suspect many of those coming to see it on the basis that it's a scintillating love story for the ages will still enjoy the less cosy film they see before them, but the sadness is that 'A Royal Affair' could be written off by many who would find great appeal in its musing on ideology and the nature of political power. Perhaps the image on the poster is not at fault, but rather it's the pull-quotes around it which need changing. "Utterly seductive" should be replaced by "politically incendiary" and the word "revolution" should appear somewhere. And instead of "their love would divide a nation", how about "their friendship would divide Europe"? And the word "love" (which appears twice) should not appear at all. Not because there is not a love story, but because focusing on that relationship and ignoring the ideological debate is ironically the exact same thing the yellow press does within the film. There's no doubt the marketing department played it very safe with this one and I hope it doesn't work against one of the year's best films. 'A Royal Affair' is rated '15' by the BBFC and will be released in the UK on June 15th. Well, I hadn't seen any of the marketing for this film but gave it a go on your recommendation. This is intended as an ego boost. Go see Stanley Kubrick: The Exhibition at EYE!! !